M&T Bank Corporation (NYSE:MTB) has seen an increase in hedge fund sentiment which also reached its all time high at the end of December. This is usually a very bullish signal. For example hedge fund sentiment in Xilinx Inc. (XLNX) was also at its all time high at the beginning of this year and the stock returned more than 46% in 2.5 months. We observed a similar performance from Progressive Corporation (PGR) which returned 27% and outperformed the SPY by nearly 14 percentage points in 2.5 months. Hedge fund sentiment towards IQVIA Holdings Inc. (IQV), Brookfield Asset Management Inc. (BAM), Atlassian Corporation Plc (TEAM), RCL, and CRH hit all time highs at the end of December, and all of these stocks returned more than 20% in the first 2.5 months of this year. In the 21st century investor’s toolkit there are several tools stock traders employ to value publicly traded companies. A pair of the best tools are hedge fund and insider trading sentiment. Our researchers have shown that, historically, those who follow the top picks of the top investment managers can trounce the S&P 500 by a significant margin (see the details here). We’re going to take a glance at the fresh hedge fund action encompassing M&T Bank Corporation (NYSE:MTB). How are hedge funds trading M&T Bank Corporation (NYSE:MTB)? Heading into the first quarter of 2019, a total of 42 of the hedge funds tracked by Insider Monkey were bullish on this stock, a change of 2% from one quarter earlier. Below, you can check out the change in hedge fund sentiment towards MTB over the last 14 quarters. So, let’s examine which hedge funds were among the top holders of the stock and which hedge funds were making big moves. 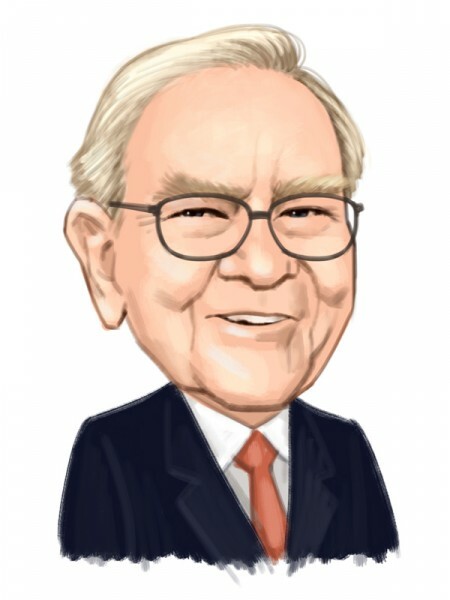 Among these funds, Berkshire Hathaway held the most valuable stake in M&T Bank Corporation (NYSE:MTB), which was worth $770.3 million at the end of the third quarter. On the second spot was D E Shaw which amassed $123.8 million worth of shares. Moreover, Millennium Management, Two Sigma Advisors, and Balyasny Asset Management were also bullish on M&T Bank Corporation (NYSE:MTB), allocating a large percentage of their portfolios to this stock. As industrywide interest jumped, key money managers have been driving this bullishness. Mendon Capital Advisors, managed by Anton Schutz, initiated the biggest position in M&T Bank Corporation (NYSE:MTB). Mendon Capital Advisors had $2.7 million invested in the company at the end of the quarter. Matthew Hulsizer’s PEAK6 Capital Management also initiated a $0.8 million position during the quarter. The following funds were also among the new MTB investors: Tom Russo’s Gardner Russo & Gardner, Alec Litowitz and Ross Laser’s Magnetar Capital, and Mike Vranos’s Ellington. Let’s check out hedge fund activity in other stocks – not necessarily in the same industry as M&T Bank Corporation (NYSE:MTB) but similarly valued. These stocks are DTE Energy Company (NYSE:DTE), Sun Life Financial Inc. (NYSE:SLF), PACCAR Inc (NASDAQ:PCAR), and Imperial Oil Limited (NYSE:IMO). This group of stocks’ market values match MTB’s market value. As you can see these stocks had an average of 17.75 hedge funds with bullish positions and the average amount invested in these stocks was $224 million. That figure was $1496 million in MTB’s case. DTE Energy Company (NYSE:DTE) is the most popular stock in this table. On the other hand Sun Life Financial Inc. (NYSE:SLF) is the least popular one with only 10 bullish hedge fund positions. Compared to these stocks M&T Bank Corporation (NYSE:MTB) is more popular among hedge funds. Our calculations showed that top 15 most popular stocks among hedge funds returned 19.7% through March 15th and outperformed the S&P 500 ETF (SPY) by 6.6 percentage points. 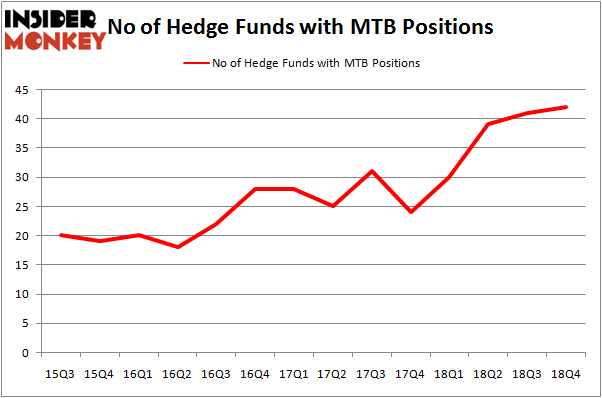 Hedge funds were also right about betting on MTB as the stock returned 21.2% and outperformed the market as well.